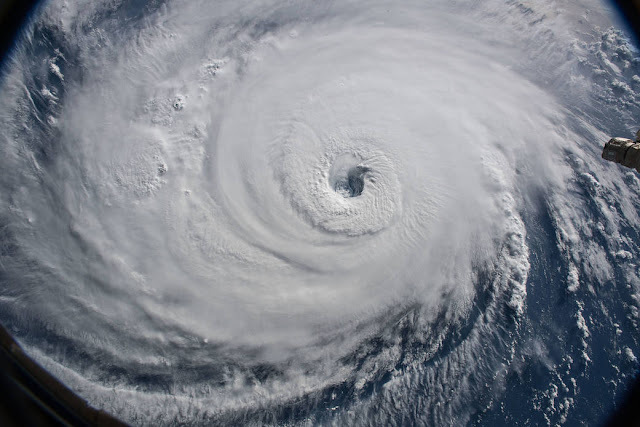 Credit International Space Station...Hurricane Florence. With the death count now at 17 a city of 150,000 has been totally cut off following Hurricane Florence. The coastal city of Wilmington, North Carolina, is completely cut off from the rest of the state as water levels rise. About 400 people have been rescued from floodwaters in the city, described as an island within the state. Tens of thousands of homes have been damaged with worse flooding to come as rivers fill to the bursting point. According to Reuters, Florence, a onetime hurricane that weakened to a tropical depression by Sunday, dumped up to 40 inches (100 cm) of rain on parts of North Carolina since Thursday, and continued to produce widespread heavy rain over much of North Carolina and eastern South Carolina, the National Weather Service said. Some rivers were not expected to crest until Monday or Tuesday, the National Weather Service said. AFP reported, "the water... has gone up 10-15 feet (3 to 4.5 meters) in a few days and it's supposed to keep rising for a few days." "That's enough to cause flooding in areas that have never flooded before until now. The risk is growing as well in the mountains, where rains could lead to dangerous landslides," he said.